Nice to meet you all. I’m an ooooooold friend of Ghost Cat. Thinking about how to integrate one of my characters into this world as I’m not too familiar with Darkwing Duck but I’m feeling creative. Regardless, how’s it going? ? Hello everyone, it has been a long time since I came here! Just gone to the Comic-Con at the weekend, guess who's at the Comic-Con? I didn't know till I looked at the schedule and saw Jim Cummings' name on it. 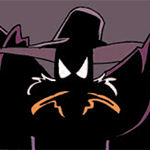 I checked the internet and saw that he really is the one who voice Darkwing Duck (and other characters). I was lucky enough to get in line when Jim was doing the signing. Took the picture of Darkwing and Negaduck and got Jim to sign it. He is such a wonderful guy! I thanked him for voice acting different characters and told him my favourite is Darkwing Duck. He even talked in his Darkwing Duck voice while signing my picture. I was so happy! First thing he said was that I must be Gosalyn's friend. I laughed as I am good with kids (now it's officially, I'm Gosalyn's friend, LOL! Just kidding! But I will put down on my fanfiction that I am friend with Gosalyn). When I told him that I love his outfit, he thanked me and said that he designed and made it himself. When I said his famous catchphase, he told me that it's okay to get dangerous but don't get too dangerous. On my autograph it said 'To ___ Stay Dangerous!! D.W. Heart Jim's signature'. I'm going to keep this super safe! And on another note, went shopping on Tuesday for a water bottle for my sister since her old water bottle is leaking. I was surprised to see these. It was Disney Afternoon theme cups. There're a TaleSpin cup, a DuckTales cup, a Chip and Dale Rescue Rangers cup, and a Darkwing Duck cup! I'm super happy to see the Disney Afternoon Shows are getting the spotlight. Hope you're all doing great, see ya! Occupation: Nellie currently works in a local music store. She likes music of all kinds, folk music, rap music, rock music, classical music, you name it. Marital status: She's single, She looks around on occasion, but never seems to find anyone. Appearance: Nellie is not very tall, but not short either, and she's a thin, lanky girl with hazel eyes and straight, light blonde hair cut in a bob with a black headband, and she normally wears a brown sweater with dark blue jeans, with gray sneakers. She also tends to look ragged and worn on some days from working late hours, and other days she looks like her bright eyed and energetic self. Super powers (if any): Uh, no sorry. She's just a regular duck. Weaknesses: Her vision isn't too good, she can't see more than two feet in front of her, so she uses glasses, but she doesn't wear them as often as she should because she's self conscious. Character background: Not much is known about her early life, but she grew up with her brother, Arnie, and her parents on a farm. Soon after Nellie had turned 30, she moved to St. Canard to start a new life for herself, and to celebrate her 30th birthday. She had heard all about the kinds of things that happened in the city, and moved right on in, in an apartment complex with her guitar, her dog, and a positive outlook. Soon she landed a job in a local music store where she shows customers around and tells them about the instruments, and (hopefully) sells them. Other info: Nellie's full name is Penelope Agatha Thurston. She needs glasses, but she doesn't use them. Her favorite food is a grilled tuna melt.